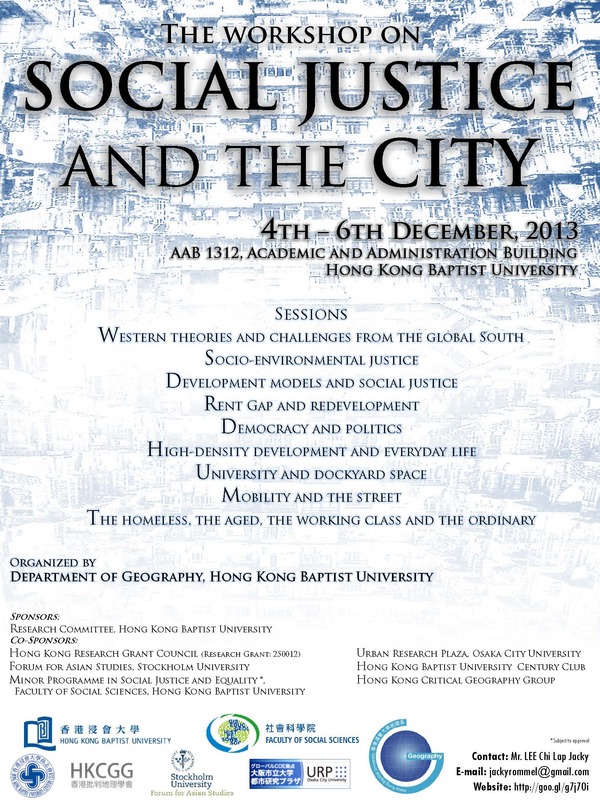 The HKCGG is a co-sponsor to the workshop on Social Justice and the City, 2013. 會議簡介如下　Here below is an introduction speech for this inspiring workshop. Since the publication of David Harvey’s seminal work Social Justice and the City in 1973, discussion about social justice has grown into a burgeoning literature. There has been research to query procedural justice in various forms and for different classes. Research has also been carried out to operationalise the more philosophical debates about justice, with Henri Lefebvre’s concept of the right to the city being the prominent case in point. Finally, there is a growing literature addressing the interrogation of social justice from the spatial perspective such as Mustafa Dikeç’s spatial dialectics of injustice. All these discussions are so relevant to the society, as the recent “Occupying Movements” around the world have testified and as Harvey’s latest book Rebel Cities has elaborated. It is timely to encourage more serious debates about social justice. Why have the rich become richer and the poor poorer? How comes the city setting aggravate the already worse working and living conditions of the grassroots and deprive the old of the basic safety net? We would be interested in discussion that builds on the stock of the research and proposes possible avenues for improvement. In particular, we encourage scholars from the subaltern, post-colonial, de-colonial and cognate fields (including the China New Left) to contribute to this debate. The latter intervention is especially worthwhile, given that cities in the non-West have been growing by leaps and bounces since the 1970s. Until recently, however, studies have been biased towards uni-directional, global restructuring. Many devoted themselves to discuss the extent to which, say, Shanghai and Seoul, have caught up with New York, London and Tokyo as a world city. If there was any discussion on social justice and inequality, attention was paid to the possible social exclusion under social polarisation. Though insightful they may be, these studies cannot tackle the root causes of social justice in cities in this region, as concepts and theories invoked are usually formulated from an alienated socio-historical setting. Let us take as an example East Asia, which has adopted a distinguishable development path. To say the least, East Asia formulated an economic system before capitalism. Since then, there have been many twists and turns during the integration with capitalism. These developments have imprints on urban social justice. Besides, as seen from the rapid urbanisation process since the 1970s, East Asian cities, with the possible exception of some Japanese, have adopted an approach that favours higher-density development, something unheard of during the similar stage of urbanisation in the West. How does high-density development intertwine with the less capitalist market-type economy and society to produce and reproduce social injustice in everyday life is an imminent agenda for research. In short, we strongly encourage papers from the world, including all developing and socialist countries. These papers would contribute to our better understanding of social justice and the city.